Enjoy the splendor of Budapest from the best viewpoint: up in the air. This scenic 25-minute flight takes you high above the glittering city’s most spectacular locations, including Parliament, Castle Hill, the Royal Palace, Gellert Hill and Citadell, and the Gellert Baths. Drink a complementary glass of champagne and cruise above the city swimming in lights. Your private tour will set out from your hotel an hour after sunset for this exceptionally scenic 25-minute flight. 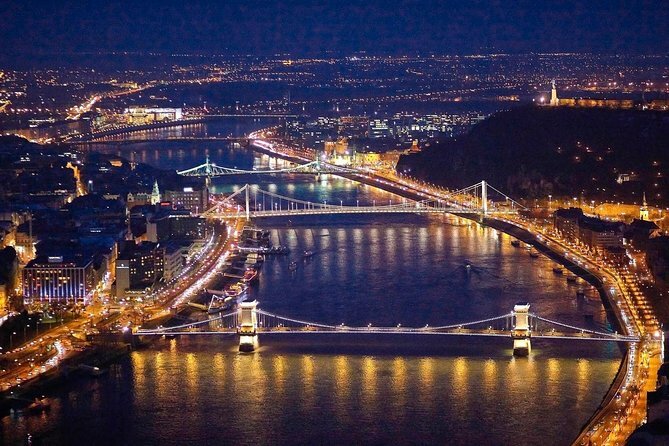 After sipping on a glass of complimentary champagne, take flight above Budapest. Fly parallel to the Danube River on the Buda side of the city; this guarantees a splendid view of some of Budapest’s amazing sights including the Parliament, Castle Hill and the Royal Palace, Gellert Hill, and the exquisite Gellert Baths. Get a broad overview of the city while cruising through the air. With the dusky sky fading to black, soak in the panorama of the illuminated city sparkling at your feet. Departure Time: Departure time is after 1 hour of the sunset time in Budapest. Drop off is included to your Hotel.